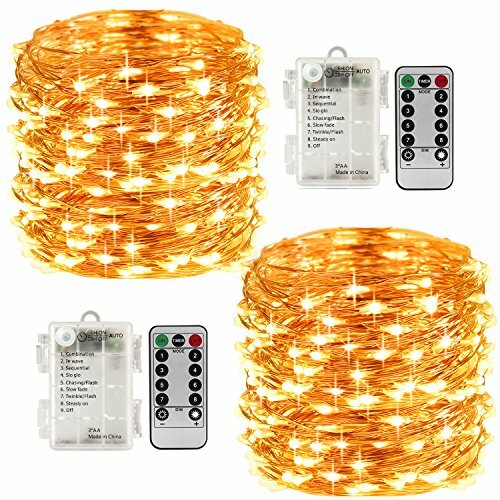 These party string lights are very popular for decoration in many occasions specially in festivals like Christmas, Thanks Giving Day, Halloween Parties, Valentine's Day, etc indoor and outdoor. These led string lights can be bent into any shapes, wrapped on anything, hung on the wall or put into glass jar with many creative ideas to create a romantic atmosphere. These warm white fairy lights are made off 100 led bulbs and 33ft copper wire which include 1ft leading wire. The distance between 2 bulbs are 3.9 inches. You can use the remote to turn on/off, change the modes of the string lights, adjust the brightness (10 levels) and set the timer. The timer setting is 6h on and 18 off. And 8 modes are combination/in wave/sequential/slo glo/ flash/slow fade/ twinkle/steady which can also be controlled by the button on the battery case. These led mood lights are powered by 3AA batteries (NOT INCLUDED) which will operate 48 hours in steady mode continuously. Operating time will be longer if you turn them off according to your need. The waterproof rating of the battery case is IP44 which means Water splashed against the enclosure from any direction shall have no harmful effect. The durable wire and bulbs are absolutely waterproof to be immersed into water with its yellowish glow and are low heat emission and safe to touch after many hours of usage. The remote of these battery fairy lights powered by 1x CR2025 button battery which is installed when you receive it. You should remove the plastic strip inserted in the remote first when you begin to use the remote. It's better to align the remote at the signal receiver in the battery box to control the lights. The longest distance to control is 33ft/10m without any obstacle. The hook on the top of the battery box is used to hang it on the wall. If you have any questions about this product by LightsEtc, contact us by completing and submitting the form below. If you are looking for a specif part number, please include it with your message.